When it comes to considering hop forward beers, particularly of the New World pale ale and IPA variety, there’s a small handful of descriptors that tend to pop up often: tropical fruit, citrus, pineapple, passionfruit - essentially anything that would go well in a fruit salad. These are all naturally occurring and abundant characters derived from the hops, but brewers on a quest for ever-punchier flavours have taken to adding the fruits themselves, whether juice, zest or whole, to enhance whatever character it is they’re looking for. One of the most popular of these adjuncts in recent times has been grapefruit, what with its natural bitterness and pleasantly sweet fruit associations. That’s what the Stockade brewers have banked on in their Hop Splicer XPA, a beer that was released once or thrice in limited quantities before making its way into the permanent range. 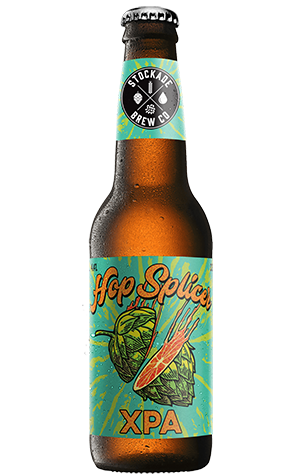 At heart, Hop Splicer is what you’d class as a quaffer; a light bodied, easy-drinking beer. But where it gets more interesting is when it puts its foot forward in the hop department, with Vic Secret, Ella and Centennial being boosted by the addition of grapefruit zest. Those all come through on the aroma and palate in a fruity melange, without much of a bitter bite. At just 4.4 percent ABV, it’s a refreshing summer-style quaffer that happens to be available all year round.